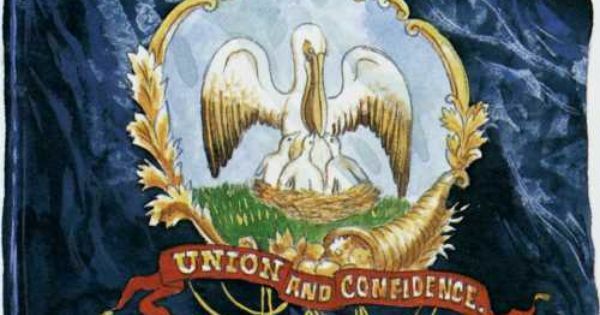 One of many variations of Pelican Flag used by Louisiana regiments (from wikipedia). In Alfred Roman's biography of General PGT Beauregard, pages 170-173, the concept of a standardized Confederate Battle Flag is discussed, following on General Beauregard's experience at First Manassas (where the "Stars and Bars" was easily confused for the National Ensign of the United States, particularly during periods of no wind). He attempted to accomplish the task through Colonel W.P. Miles (who is often credited with the design eventually adopted), but early efforts at standardization failed. In meantime, regiments were encouraged to use their State Flag until the issue was resolved. Bottom line: just like almost everything IRT the Battle of Shiloh, no assumptions can be made concerning what particular Battle Flag was carried by Confederate troops on April 6-8 of 1862; each Army of Mississippi regiment must be examined -- individually -- to determine the style of flag carried, with most likely options being Corps-style flag, old "Stars and Bars," and State Flag. Did any Confederate units go into battle with War Flag and National Flag? Probably, although I have yet to find any evidence. Some obscure diary will likely reveal that it was done. Volunteers tended to act in accordance with their own drives and motivations, without complete regard for "the proper way of doing things." In general, did US Regiments at Shiloh carry TWO standards, the National "Stars and Stripes" flag and a second Regimental flag, usually with the national Eagle on it? The evolving and expanding nature of the 1861 Rebellion, with neither side prepared for a long-duration war, necessitated the establishment of priorities: substantial numbers of volunteers were quickly organized into regiments; those regiments were provided with weapons; and uniforms (of no standard color or design) were acquired, often through the efforts of women's organizations. Many of the earliest regiments were 90-day regiments (and their July/August 1861 expiry allows them to act as "time capsules," show-casing the embryonic nature of their preparedness and war-fighting capabilities.) One such time capsule is the 1st Iowa Infantry: each of its ten companies wore a different style of uniform; the weapons issued to the regiment were "converted flintlock muskets" ...and the 1st Iowa never possessed a dedicated Regimental Color. The hand-sewn National Flag served a dual role. Many Federal volunteer infantry regiments seem to have followed the same course as the 1st Iowa: their National Flag (with identification of the regiment written along a center stripe) appears to have sufficed... until some months after the Battle of Shiloh. Around the middle of 1862 a General Order appears to have been issued, requiring that every Federal infantry regiment be equipped with the two Flags stipulated in the 1840s Army Regulations. And this 1862 directive specified that the size of the Regimental Color would approximate a square, 6 feet on each side. And the color of the field would be blue. This allowed regiments from some states (such as Wisconsin, Michigan and Maine) to continue with State Flags as Regimental Colors. For everyone else, a machine-produced government-issued "blue banner" with American Eagle became available, beginning about July 1862. By the time of the 1863 Siege of Vicksburg, it appears that all Federal infantry regiments had acquired their two flags. Sorry that this post is not definitive. But once I track down the 1841 Army Regulation and the 1862 General Order, I will provide their details in a future post. For now, it appears that most infantry regiments at the Battle of Shiloh -- whether Union or Confederate -- possessed a single Regimental Flag. In the General Regulations for the Army (1841) Article LIX, Line No.457 (page 80): "Each regiment of infantry shall have two silken colors: a National Color of Stars and Stripes: and a Regimental Color of blue..."
General Orders No.95 of November 5, 1861: authorizes a National Flag and Regimental Color for every regiment (but does not mandate the possession of those items). General Orders No.19 of February 22, 1862: directs that the names of battles engaged in by regiments shall be inscribed on the Regimental Color. Both were carried into battle. VERY interesting stuff, Ozzy and Jim: Thanks very much for going through the efforts to locate this info!! I'm delighted to have found this discussion group! Here's one that's inconsistent with what I've been reading online-The flag pictured below is labelled online as the flag of the 154th Tennessee Senior Regiment, captured and recaptured at Shiloh. I don't where this flag is currently displayed. It appears to be one of the Henry Cassidy flags ordered from New Orleans by General Beauregard. The site confederateflags.org states that BRAGG'S Corps had previously been issued with the 1st order of these flags and fought under them at Shiloh. It FURTHER states that a SECOND order of these flags for Polk's Corps had not yet arrived when the army left Corinth and that POLK'S Corps fought the battle with their Polk battle flags. Just trying to zero in as much as I can on flags carried at Shiloh; Does anyone have further info on the "Cassidy" battle flag being carried by any of the units of Polk's Corps? 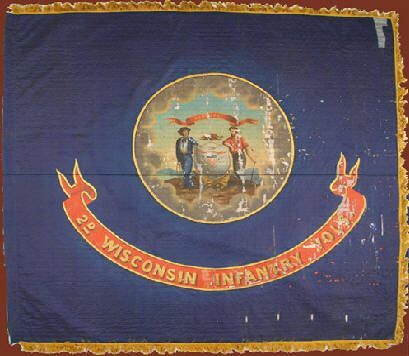 I've read that Wisconsin had no "official" State Flag at the outbreak of the Civil War, and that Wisconsin Regimental Colors (designed by men-in-ranks) served as the template for what became the official Wisconsin State Flag. Do you know if this is true? Interesting discovery IRT the 154th Senior Tennessee Infantry Regiment and their Colors. I know that LtCol Marcus Wright kept a diary during the war. Perhaps he included information about how his Regiment came into possession of a Bragg Flag. http://en.wikipedia.org/wiki/154th_Tennessee_Infantry_Regiment 154th Senior Tennessee entry at wikipedia indicates the flag was accepted just prior to Shiloh as part of attempt by General Beauregard to standardize the colors used by Army of Mississippi ...but more sources than wikipedia needed to confirm this information. http://confederateflags.org/army/fotcaotm/ This page of confederateflags.org [scroll down to near bottom of page] provides detail IRT the acquisition of Cassidy flags from New Orleans by General Beauregard, for use by Bragg "and others," but only about fifty flags arrived before Shiloh: not enough for much more than Bragg's Corps. http://www.loeser.us/flags/civil.html This site details many of flags, banners and colors used by Union and Confederate regiments during the Civil War [of value for general information, and links to more detail]. http://www.scv.org/curriculum/part8.htm Scroll down a short ways to the picture of Leonidas Polk, and in the two or three paragraphs adjacent, explanation is provided IRT General Breckenridge's use of the First National Confederate Flag (Stars and Bars) as his Corps Flag until 1863. I have run across numerous references indicating Breckenridge used the Stars and Bars as his Corps Flag at Shiloh, so provide this particular reference as an example of what is out there. In 1863 Wisconsin had not yet adopted an official State flag and the Civil War regiments in the field were requesting an official banner to fly. The legislature formed a five-member joint select committee to respond to these requests and, as a result 1863 Joint Resolution No. 4 was adopted. This resolution essentially adopted a design that was already in use by the Wisconsin regimental troops. In 1913, this resolution finally made it into the official state statutes of the state of Wisconsin. Chapter 111, Laws of 1913 specifying a dark blue flag with the state coat of arms centered on each side, evolved into Chapter 1, section 1.08 of the Wisconsin statutes. As with other states who chose to display the state coat of arms or seal on the official state flag, Wisconsin found that their flag was difficult to distinguish from others. After years of effort to distinguish the Wisconsin flag in some more noticable way, the enactment of Chapter 286, Laws of 1979 responded with the addition of the word "WISCONSIN" in white letters above the state coat of arms and the date that Wisconsin was admitted to the union, "1848" in white letters below the state coat of arms. It is said: There are few things more permanent than a "temporary solution." The story of Wisconsin and her prolonged use of a Regimental Color as State Flag would confirm this. But as an observation, I preferred the circa-1863 design to that modification made in 1979. It is reported that the change to the State Flag was made to "distinguish the Wisconsin flag from other State flags of similar design." However, in making the change, I believe law makers missed an important point: for the North, the Civil War was about Nation over State, and ideals over pragmatism. Facing a wall of determined Federal volunteers, an enemy would see one blue regimental flag after another, from a distance each blue flag indistinguishable from its neighbor; but each blue banner representing another earnest, unstoppable force of 1000 men, prepared to follow their banner to the death. And if Wisconsin, Maine, Michigan and Minnesota continued with "similar-looking" State flags after the war, it merely offered an opportunity to remind the uninitiated of the hard-won lessons of "strength in numbers," and "from many, one" ...and, "Yeah, they all look the same because we all fought together on the same side." This first one runs for less than five minutes and is narrated by Greg Biggs (who has featured on other YouTube videos as well, explaining Fort Henry and Fort Donelson.) The above provides a concise history of Civil War flags, and Mr. Biggs confirms that Federal regiments made use of two flags; but Confederate regiments made use of a single flag, in accordance with instructions found in Hardee's book on Light Infantry Tactics. Video created by Civil War Trust in 2015.
http://www.youtube.com/watch?v=Lysu9sYPsYE Civil War Flag Conservation by North Carolina Department of Natural and Cultural Resources and posted in 2013 features curators and archivists describing the history of five Confederate flags, their creation, use and conservation. The first five minutes are of most interest, detailing the four types of flags in use during 1860-1865 (and the fact that many states -- North and South -- did not have a recognized State Flag at the start of the war.) The flags discussed: State flag-style Regimental Color (2 minute mark), Stars and Bars (14:30), Army of Northern Virginia-style Regimental Color (24:00), Small personal flag (31:00), and Second National Flag used by a regiment at Gettysburg (42:00). Above video links represent examples of worthwhile historical information yet to be discovered on YouTube. I believe the man responsible for meeting the Army Regulation requiring that all Federal regiments possess two flags was Montgomery C. Meigs, who was appointed Quarter Master General after April 1861 and immediately went to work supplying the needs of an Army that within one year grew from approximately 15 000 to over 500,000 men. As stated before, priorities had to be set IRT arms, uniforms, food, tents and transport; but once those essentials were under control, I believe Meigs turned attention to lower priorities and accomplished those, too. (I believe regimental colors began to be supplied, beginning July 1862.) And General Meigs kept a journal in which he made daily entries, so it seems logical that mention would be made in that journal IRT his efforts, his priorities, and re-setting of priorities as slack in the Supply System appeared. Not too go too far off topic, but in speaking with the site manager at Perryville, the only unit to fly what is commonly known as the battle flag was the 5th Company, Washington Artillery. The infantry of both Polk's and Hardee's Wings used the National Flag, along with the Polk and Hardee flag. Ironic to the conversation as Perryville was fought six months after Shiloh, yet the battle flag wasn't in use other than by one unit. I do not know if the Confederate Army at Perryville had abandoned the Beauregard-sponsored Cassidy flag and reverted to the old "Stars and Bars" of the First National flag, but it sounds like something the pertinacious Bragg would direct his Army to do... I am in process of investigating the reasons why Braxton Bragg never got around to writing his memoirs, and ran across this story, out of Chickamauga: Upon hearing reports that the Federal army under Rosecrans was abandoning the field of battle, General Bragg refused to believe it. He called a soldier who had witnessed the Federal evacuation, and even after the soldier presented his report, Bragg shook his head, and demanded to know, "Do you even know what a retreat looks like?" "I ought to, General," replied the man. "I've been with you during your whole campaign." Ozzy...I dont know shorthand but have seen it...wonder how Mieg's shorthand compares to the standard sh of today..Or was it a code only he could deciepher? I've had a look online for evidence someone has written a plain-text version of Meig's journals, but no luck as yet. Meanwhile, I have run across the Library of Congress Finding Aid (used for tracking down elements contained in the "Montgomery C. Meigs Papers") and that Finding Aid describes the "mid-nineteenth Century shorthand" used by Meigs as "mostly undecipherable" [page 5.] However, on page 16 there is guidance for "how to obtain the File of Orders and Decrees issued by Meigs while he was QM General during the Civil War" ...the file has been copied onto microfiche, and is available for viewing at the Library of Congress: Box 38-47, Reel 11-20, Shelf no.18,202.1. I had the fortune of visiting the Library of Congress many years ago: I had an afternoon free and thought I would "browse the shelves" to see how their references were organized, and peruse items that struck my interest (such as historic maps.) But when I entered the Main Doors and approached the Inner Entry to the Library, I was called back, and directed to a long counter, behind which stood half-a-dozen stern-looking functionaries. One of them deigned to speak, and asked my intentions. I reported "I was just going to have a look at historic maps." I was told, "That's not how it's done; I must submit a written request for material and wait for it to be delivered." The whole process was more lengthy and involved than I was expecting... I decided to spend my afternoon elsewhere. I know this is an old post, but wanted to chime in. I saw where this flag is actually thought to have belonged to a Mississippi regiment. The flag was captured on 6 April and then recaptured by the 154th Tenn on the 7 April. Not sure though. Would love to track down the details of this flag.